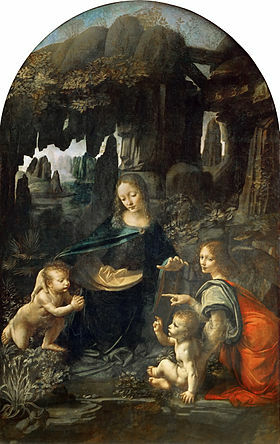 After arriving in Milan to serve the Sforza court there, da Vinci painted this work as a meditation on the human side of the life of Jesus, seen here playing as a child with his cousin, John the Baptist. The choices da Vinci made with the somewhat bizarre landscape continue to confound art historians, and a light sfumato, or haze, surrounds the figures and gives them a warm intimacy. It reflects the intellectual rigor and curiosity that made da Vinci famous and made him a paragon of his time.